If you want to create a pitch deck and you don’t know where to start, you can use an Emaze template called The Investor Pitch. you have there all types of data you need for Investor Pitch – just change the content and you are ready ! 1. Your vision– write your vision in a length of a tweet. 2. Milestones– what do you plan to do in the next year like Kickoff, Proof of Concept, Complete Prototype, Alpha Launch etc. 3. Success stories– Who are your clients ? which successes did they achieve thanks to your product or service ? if you don’t have Success stories give some kind of proof like feedback from Popular figure. 4. market opportunity– who should benefit from your product ? 5. the problem– each product has created due to some problem or need. What is the biggest problem of your audience ? 6. Current Solutions– what are the Current Solutions for this problem and what the disadvantages of them ? 7. Our Service– explain about your product / service. How can it solve this problem ? 8. Revenue Model– your primary customer, The pricing model, Current revenue and CLTV. 9. Marketing & Growth Strategy– How are you going to market your product / service ? 10. The Team– What is the expertise of each team member ? 12. Investment– the money time – how much money do you need from the investor ? 13. Go to Market– Alpha, Private Beta, Public Beta, Public Launch and Scaling. 15. Competitive Advantage– make a comparison table of the market players. 16. Use of Proceeds– how you are going to use the invested money ? it’s recommended to create a pie chart that show how many percentages of the entire investment are you going to allocate to each purpose. 17. Global Market Share– show a pie chart of global market share. If you want to use Emaze for business purposes, I recommend using Emaze premium account. 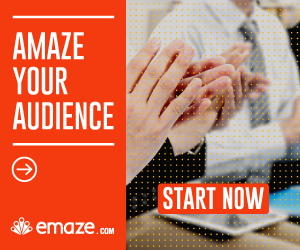 You can check out here all Emaze pro features and get 30% off for 1 year.